Watching a reading of a new work of theater is one of my favorite things, and there are many opportunities here in #TCTheater (the Playwrights' Center has free readings of new works all year round, and theaters such as History Theatre, Theater Latte Da, and Illusion Theater have annual new works festivals). 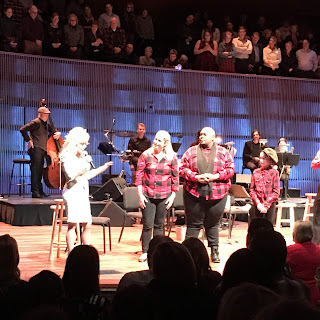 Last night I attended one such reading at the Ordway Center for the Performing Arts, a brand new musical based on the Dickens' classic A Christmas Carol. * It's a beautiful, transcendent, heart-warming story that holds up to the many adaptations. This adaptation is particularly exciting because it features new music written by songwriting and performing legend Dolly Parton, and she's in St. Paul to introduce and watch the show herself! Even better, the mayor of St. Paul declared yesterday Dolly Parton Day. Friends, I wish every day could be Dolly Parton Day; she is a gem, a ray of light, a true gift to the world. 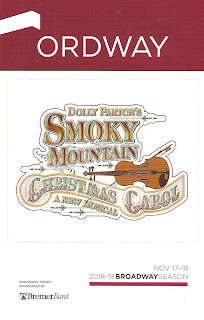 Smokey Mountain Christmas Carol (with book by David H. Bell, directed by Curt Wollan, one of the creators of the The Church Basement Ladies) follows the original fairly closely. 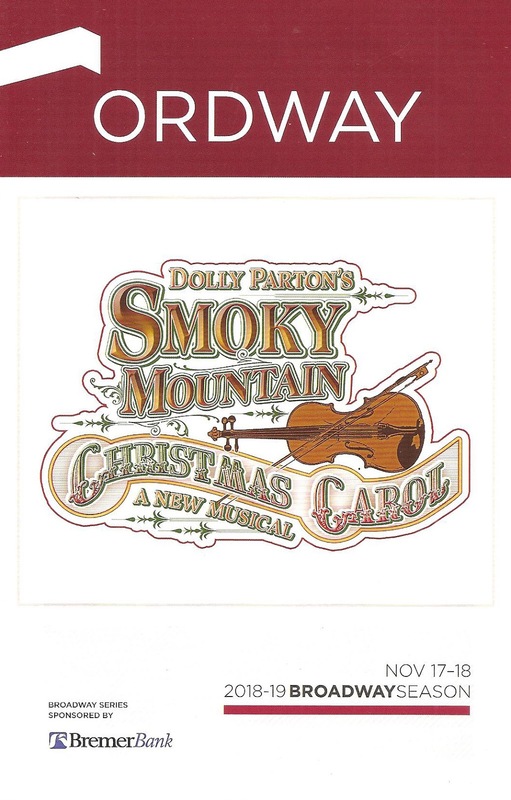 Except that it's set in the Depression era Smokey Mountains and Scrooge is the evil and greedy mine owner. Like any new work it could benefit from another round of edits; it feels a little long, with too much time spend on strikes and prohibition detracting from the main story. But what I wouldn't cut is any of the dozen or so songs, all of them keepers. I'd buy a cast recording today of this country/bluegrass score featuring toe-tapping numbers and moving ballads. Like all readings I've attended in this talent-rich city, the musical is "read" by a talented cast that puts everything into the performance despite only having five days to rehearse together and having a script in front of them. This mostly local cast includes Dane Stauffer as Scrooge, Mabel Weismann as Tiny Tim, and Brandon A. Jackson, Carl Schoenborn, Caroline Innerbichler, Darrell Johnston, Louis Sacco, Ruthie Baker, and Vanessa Gamble as multiple characters (this could be a large-cast musical, but I kinda love this industrious small-cast version). The cast is accompanied by a fantastic six-person band from Nashville, lead by music director Tim Hayden on piano. I hope that Dolly and her team continue to develop this musical, I'd love to see a full production premiere at the Ordway. New Producing Artistic Director Rod Kaats said before the show that this was the first world premiere at the Ordway in 10 years. I'd love to see them do more world premieres, or even regional premieres (I'm still waiting for someone in #TCTheater to produce Fun Home). With their Ordway Originals they've proven they can produce Broadway-style musicals with local talents Their next one is 42nd Street next summer, but I'd love to see them invest in new works such as Dolly Parton's heart-warming, funny, folksy, musically rich Smokey Mountain Christmas. There are two more readings today with limited tickets remaining - check the website or call the box office for info.